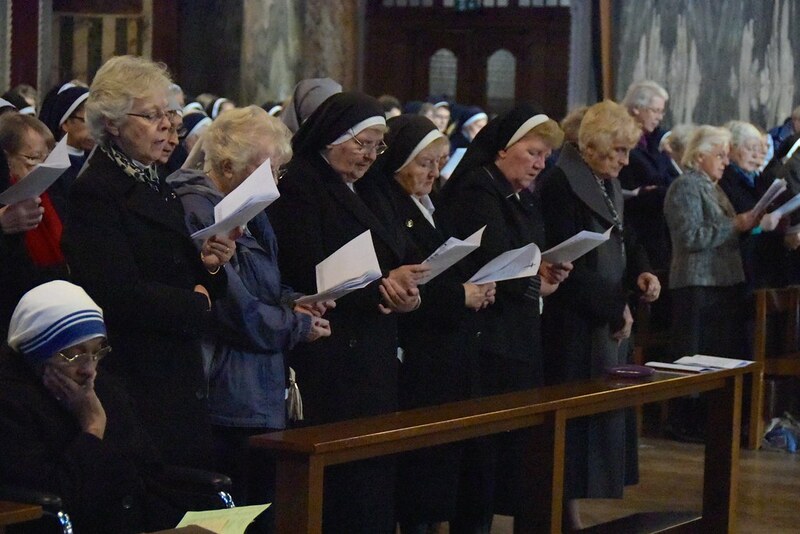 On the Feast of the Presentation, 2 February 2016, Cardinal Vincent celebrated the annual Mass for Consecrated Life. Coming at the closing of the Year of Consecrated Life, it was an opportunity to celebrate the role of all consecrated men and women in the diocese, in the context of the Jubilee Year of Mercy. Joining Cardinal Vincent were Bishop John Sherrington and Bishop John Wilson, as well as Emeritus Bishop of Menevia, Bishop Mark Jabale OSB, a former abbot of Belmont Abbey. At the start of Mass, Cardinal Vincent paid tribute to Sr Amadeus Bolger, who recently retired as Vicar for Women Religious, for her many years of dedication and service. He thanked Fr Robert Marsh OSA, for his ministry as Vicar for Religious for the diocese. The Cardinal also acknowledged all religious who were celebrating silver, golden and diamond jubilees. In his homily, he spoke about Fr Engelmar Unzeitig, a Czech priest who was declared Venerable by Pope Benedict and a martyr for the faith by Pope Francis. From his fearless defense of the faith in the face of Nazi atrocities to his selfless service of his fellow inmates in Dachau, Fr Unzeitig's life is 'a marvellous picture of mercy in action,' said the Cardinal. The Cardinal then thanked 'God for the mercy filling the lives of so many religious men and women, who today rededicate their lives to God'. The full text of Cardinal Vincent's homily can be read here.